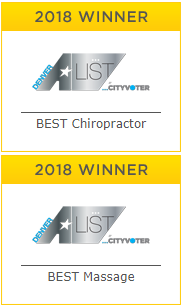 Moyer Total Wellness was recognized as the #1 place for Chiropractic Care in Denver in 2018 by the Denver A-list voters for “Best Denver Chiropractor”. Treating the muscles is what sets us apart from most other Chiropractors in Denver. Chiropractic care sessions at Moyer Total Wellness are a minimum of 10 minutes, and usually 25 minutes. Chiropractic adjustments are used to reposition joints that are out of alignment. Our Chiropractors use various muscle release techniques that provide long lasting relief from pain, stiffness, tightness, and even weakness. Adjusting the spine alone can provide quick pain relief, but tight muscles can pull things back out of alignment quickly. This can result in the need to visit your chiropractor weekly, or even multiple times in a week. However, when your chiropractor examines and treats the muscles associated with the problem, pain relief lasts longer. When your chiropractor works directly with your massage therapist, pain relief lasts even longer. When your chiropractor prescribes the right exercises (and you do them!) pain becomes a thing of the past. Leading a healthy lifestyle can be hard. At Moyer Total Wellness, we empower our clients to take an active role in their health through education, motivation, and accountability. Initially, our clients come to us because they have muscle or joint pain. They have a neuro-musculo-skeletal condition that they think massage or chiropractic care can help with. During the chiropractic New Patient Exam, a diagnosis is made and treatment plan is formed. The treatment plan involves home exercises specific to the condition, as well as general lifestyle strategies that involve oxygen, water, food, movement, rest, and avoiding stress. When our clients work towards improving their circulation, reducing stress, eating well, and maintaining an appropriate level of fitness, they reach their health goals. They are happy with their results. They come in monthly for massage or chiropractic care. They refer their friends in too. Your personalized wellness team consists of 3 people: Your Chiropractor, Your Massage Therapist, and most importantly –You. When your chiropractor adjusts misaligned joints, treats problematic muscles, recommends the right exercises, communicates with your massage therapist, and you do your homework, pain goes away fast, stays away for long periods of time, and you are able to achieve a higher quality of life.